There is an echo in my house today. It’s the beautiful sound of a child’s guffaws reverberating off my walls. I made Little Man laugh again. A hearty chuckle gurgling up from deep within his chest. This is like sweet, dripping, golden honey to me. It’s been a long wait for these moments of exploding joy again. I’ve been sitting by this particular brook for a while now wondering when the water would wash back over us again, bubbling up to the surface and setting us free. Nothing is worse than the absence of joy. It’s an empty field to sit in. It’s deadened silence. Little Man used to laugh. A lot. He used to make us laugh and himself laugh all day. He was—no, is— my most jovial child. He used to grab life with both hands and see the best part of it, even in the moments when the rest of us were a bit more sour in our outlook. Then, one day, Little Man’s part of the family noise went silent. And none of us could find the key. I didn’t want to settle for smiles now and again. They felt flat to me. They weren’t him. Without happy giggles throughout the house, it felt like Little Man just didn’t even live here anymore. All of us noticed it. My other children asked where he went. As a mother, hoping for a complete return of Little Man seemed so scary, such a set-up for failure and deep disappointment. But, also as a mother, there was absolutely no way I wasn’t going to scale walls, dig tunnels, climb mountains, swim reservoirs, and passionately scream my way back to old Little Man again. I wasn’t going to give up. Nobody was going to tell me this is just the new Little Man. I wasn’t going to accept that. My God is so much bigger than whatever was choking Little Man. I’d beat the tar out of whatever it was, screaming for Jesus to help me, all day and night until I broke its clutches. I wouldn’t rest until Little Man could break free. I furiously whacked at everything that and everyone who tried to suggest to me he was gone. We don’t always get back what has been taken from us. I realize that and have so much sympathy for those waiting for that return to normal or the way things used to be. I also know that loss is sometimes so great that it does not reverse. But any parent out there watching a child suffer emotionally, physically, mentally, socially, or spiritually knows that there is a lion/ess within us with an incredible growl. And suddenly the whole world hears it when we are fighting for our cub. It’s a roar shot straight into the universe. That is the place I found myself earlier this year. I think mourning or grief of any kind feels like this at some point. We turn blue in the face waiting for joy to come back. We’re often not sure if it ever will. But a few months ago, a giggle here and there starting peeking through the clouds in our house. Then he started planning for the future again, which psychologically means a return of some level of hope. There were pained, worried, serious looks in-between that made my heart completely stop, struggling not to drown in fear. But then it went from enjoying our company to making his own humor again. And when a heart is lightened, it can finally bounce quickly in response to someone else’s joke. Happy reflexes came back. Joy was more instant. I could almost see the elephant that had been sitting on his shoulders all year growing wings and flying off. And while we’ve had a mostly full return of Little Man in recent months, my heart still skips a beat at the goodness of the Lord in holding us up through this trial, showing us how to help Little Man, keeping hope and faith flickering like a wick that won’t go out, sustaining us as our hearts ached, and being the center of where our true source of joy is, no matter the circumstances. He was holding Little Man close during this trial, and He was building laughter back into Little Man, but Little Man was also under reconstruction. God used a lot of people and specialists to bring this about, because He loves to do that, but He also put Little Man back together again in ways only He can. I know this because years ago, He put me back together again too. It’s tempting for us to think the times of deadening silence are the absence of God. The truth is, those are moments when we can see Him more clearly, if we’re looking and our hearts remain open. When laughter returned to our home, we knew what we had been missing. We had new appreciation for what had been taken, by circumstance and struggle—and what had been given back. Would God still have been our amazing God if this road had been longer (honestly, the journey is not over; we are just getting a better handle on it), or if we had lost Little Man in ways greater than I can bring myself to write out? Yes, He would have. Because it’s not which answer that comes in that makes Him God to me. It’s the fact He is listening, present, comforting, trustworthy, faithful, peace-filled, and sustaining, no matter the result. I truly cannot imagine walking this road, or any hard road, for that matter, without feeling His palm pressed into mine (because I asked Him to hold my hand and help me). Psalm 30:11-12 You turned my wailing into dancing; you…clothed me with joy, that my heart may sing your praises and not be silent…. Little Man’s battle may not be over. Or another trial could be waiting for us around the corner with a different family member. Struggles are part of the dance of life. But today I celebrate the return of joy. Because when it’s gone for a long while, we realize how incredibly precious and vital it is. For more on how faith in Christ helps us weather these storms, kindly refer to blog posts in the Anxiety/OCD/Depression pages of this site and the book Not Just on Sundays: Seeking God’s Purpose in Each New Day (includes Book Club Discussion Questions). * This blog has also been shared at any link highlighted here: Mom 2 Mom Monday Link-Up, Make a Difference Mondays, Pick Your Pin Tuesday, Women With Intention Wednesdays, Grace & Truth, A Little R & R, RaRa Link-Up, Me, Coffee & Jesus, Dance With Jesus, Breakthrough Link-Up, Blessing Counters, Coffee & Conversation, Saturday Soiree, Tell His Story, Find Stability, So Much at Home, Faith-Filled Fridays, Reflect His Love and Glory Link-Up, Bonbon ‘n Coffee Linkup, and Christian Mommy Blogger. I consider myself deeply committed to keeping relationships working. So, when they fail (due to my own shortcomings and/or someone else’s issues), I take it very hard. I’m sure many of us do. I believe that there are very few situations in life that warrant a complete walk-away. Taking space: Yes! That comes up from time to time and is healthy. But jumping on an exit ramp out of a relationship at the first disappointment or hurt: No. This has been on my mind as I thank God for relationships in my own life that have healed. Sometimes, people take a lot of space from each other. That can be painful and rejecting, but it is also a chance to pray for God to put things back together. That is what I have done in several situations, and He is so incredibly faithful. In some cases, the wait has been years. Yes, years. Sometimes, it was just months. But it was always worth the wait. Has every broken relationship in my life healed? No. Will they all heal? I don’t know. That depends on the other people, too, and where their hearts are, but I do know the best thing is asking God to do something beautiful with the wreckage, show me my own wrong, and help me to remain in a posture of humility. Is there any other posture possible, really, when we want reconciliation? It doesn’t mean being a proverbial doormat and taking all wrong upon ourselves if some of it isn’t ours to take. It just means being ready to be sorry, apologize, open our arms back to the one ready to rejoin us. When we stand in angry stances, we aren’t exactly an open door. That said, I don’t believe toxic relationships should be re-started unless new boundaries can be agreed upon and followed, so I’m not suggesting every situation is healthy enough to re-enter. There are definitely situations in which we need to let go or keep distance when they are regularly unsafe, emotionally or otherwise. I don’t have a hang-up about my kids losing some friendships and making new ones along the way. That’s part of life. It’s human sorting, more or less. It’s how we find out what we value in ourselves and others. And that leads to growth. But I do celebrate when they make a choice to not permanently shut off or out a person they once cared deeply for—when they take the space needed but leave an open door for healing and recovery. Not every relationship will go through that door, but doesn’t it teach us something so beautiful about God’s redemptive work and reconciliation to Himself through Jesus on the cross on our behalf when we see Him take our yielded, open hearts and make what’s messy all sparkly and new? There is so much darkness and lack of hope in this world that one of the most precious things to me is seeing answered prayer through restored relationships. It’s God working in our midst, taking what is broken on each side of the relationship and giving it the wholeness only He can give. He asks us to be reconciled, before it escalates into something big and brutal. Are there places you desire this? Do you struggle, like I do, on waiting it out, being patient, letting God take it? We can find hope in His promises, today and always, if you trust Him and call Him your own. There is a God who hears and wants to bring not only reconciliation of people to Himself but also with each other. It can require the often difficult choice of humility and a yielded heart, but that’s the road I want to always travel on—because it’s the only one that leads to peace of heart and lived-out grace. Therefore, if anyone is in Christ, the new creation has come: The old has gone, the new is here! All this is from God, who reconciled us to himself through Christ and gave us the ministry of reconciliation: that God was reconciling the world to himself in Christ, not counting people’s sins against them. And he has committed to us the message of reconciliation. 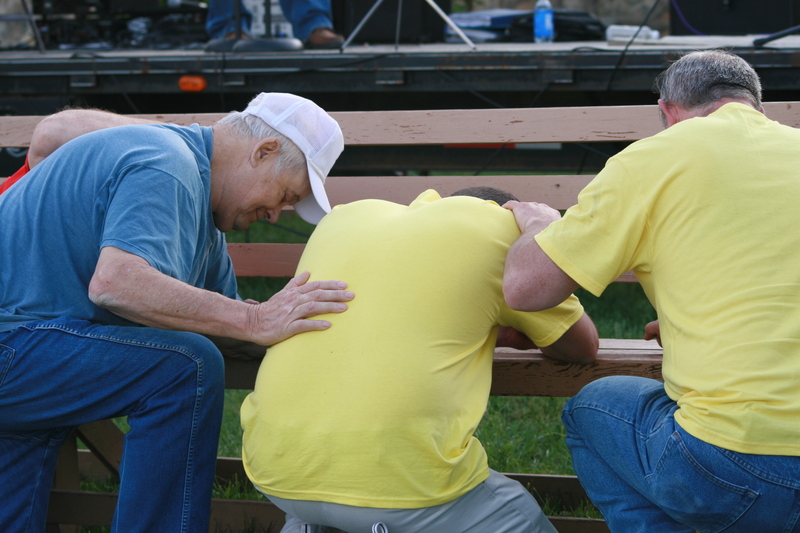 More on relational healing and restoration can be found in Not Just on Sundays. *This blog linked up at Grace & Truth, Saturday Soirée Blog Party, Christian Mommy Blogger, and Mom 2 Mom Monday Link-Up. The blog right before this one talked about opening ourselves up to more feedback in life. This one is more about the times when we need to keep our circle small. I don’t know about you, but when I’m hurting, my circle of interaction suddenly shrinks to about five people outside my own immediate family. I think we’re all selective on purpose, during these moments, as a self-protection reflex, an instinct. I’m sure shelves of psychology reference books have been written about this very thing. Part of the reason behind the shrinking circle is because others are often in their own very rough seasons and can’t really take on something else right now to help. And that’s okay. We’ve all been there. Another reason is because it can be difficult to be around people who aren’t tuning into our pain on any level. It can be beneficial to just put those relationships on hold until we regroup and come out of the gray clouds over us. They’re still our friends. They just might not know what to do in this particular situation. That’s okay too. 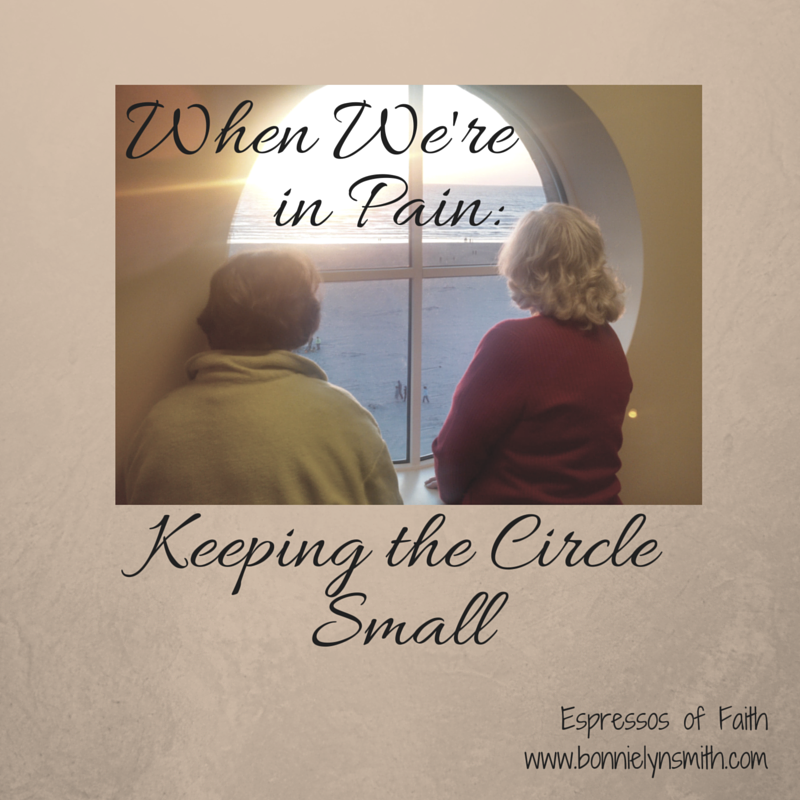 Sometimes our pain touches in too close to someone else’s pain, and they can’t be part of our inner circle for this reason—at least not in this exact moment. Grace, much grace for them. It’s okay to need some space in these situations. Our experiences can be used to help others, certainly, but if we are still in the throes of deep pain ourselves, it might be wise to not advise others until we’ve come out of it. Then there are other folks who only really want to be around us for what we offer—not for what we need. That’s okay, too, but they are definitely not entering into the inner circle of “safe”—and really, it’s okay, because that’s not necessarily their goal. They don’t want to. Better we realize that up front. It’s all about expectations, and setting them correctly. Neither should we let in, during these very sensitive times, those likely to remind us of our own failing (or the failing of one of our children) later. While we may find that our support group of prayer or bringing meals in a moment of sickness or sorrow may be larger than we realized, when we are either struggling with our own particular torment, or a loved one in pain or at risk, we tend to not want to share that with the world. We tend to keep it close, at least until the storm has passed. Although people are well meaning and offer comfort in their own ways, there are also those tougher moments when someone might walk right up to us, see our tears ever on the edge and rigid tension in our face, and talk on and on about themselves in whatever mundane way or demand our audience over something we can’t really handle at the moment. And while they are not wrong—just maybe a little insensitive—it can make us want to run and hide, find the exit ramp and speed madly down it. These are the things that overwhelm me personally when I’m in that place. One of my worst triggers is not feeling heard or understood. It also throws me into a panic if I think someone is coming to take from me when I am beyond depleted. I’d so much rather not be approached when I am in that place if the pain is going to blown past as if it is a figment of my imagination. That’s assuming, of course, the person is aware. Obviously, they are not accountable for what they do not know. And it needs to be accepted. We recently closed our shutters during a nine-month struggle getting one of the birds in our nest from mental unwellness to a better place of mental wholeness—or something approaching it. I walked around during those nine months tensing up so incredibly afraid of encountering people who wouldn’t “get it” because they hadn’t experienced anything like it yet (thank God! ), wouldn’t offer grace, would probe unkindly, or would still want to take something from me in my weakness. My shoulders are still coming out of that tense posture, even now, months after the crisis. And I did run into those kinds of people. Definitely. And I had to draw my boundaries. But I found more grace along the path to soothe my wearied, battered soul—dear, trusted folks who loved me back to safety. And really, it’s healthy to keep the circle smaller in those moments. Not only is our private stuff, well, private, but I find God calls a few people to help carry us in these times—not the masses. The masses often bring tangible provision, like meals during moments of sickness or for welcoming a new baby, but few will walk through each burden with us in our heaviest times. And that’s okay. And it may be different people each time. Sometimes it’s a family member or a different friend than the last situation. I love how God uses the people who are going to be able to give us what we need emotionally and offer good counsel at that moment in that particular struggle. I don’t think we’re all meant to carry around all burdens at once. It would be too weighty. Only Christ could do that on the cross. I need to also be okay with the idea that I am not always someone else’s answer or “circle person” as they walk through something difficult. I love it when I can be used in this way, but I certainly cannot meet every deep need out there. None of us can. That’s why listening for His guidance and leading is so important. It can overwhelm otherwise. #Proverbs18_24 One who has unreliable #friends soon comes to ruin, but there is a friend who sticks #closerthanabrother. What do you think? Do you find this to be true? More of our faith walk through personal struggles can be found in Not Just on Sundays: Seeking God’s Purpose in Each New Day. *This blog has also been shared at any link highlighted here: Mom 2 Mom Monday Link-Up, Make a Difference Mondays, Pick Your Pin Tuesday, Women With Intention Wednesdays, Grace & Truth, A Little R & R, RaRa Link-Up, Me, Coffee & Jesus, Dance With Jesus, Blessing Counters, Coffee & Conversation, Saturday Soiree, Tell His Story, Find Stability, So Much at Home, Faith-Filled Fridays, Reflect His Love and Glory Link-Up, Bonbon ‘n Coffee Linkup, and Christian Mommy Blogger. I’ve been tossing this subject around in my head for a while now—from all different angles, actually. As a writer/blogger, I face this issue frequently, especially on social media. A friend from high school and I recently had a good back-and-forth on this one. I always find it helpful to have others voice their thoughts or responses, even if I don’t fully agree with all of what they have to say. But sometimes, with a few days to chew on it, I find I either learned something significant from the feedback, or I remain strong in my resolve that I don’t agree. Either way, feedback and constructive criticism should not be something that we fear. In this case, it was helpful to hear another perspective on the use of social media (our particular topic). I won’t likely change my use of it based on this feedback, but I will be far more aware of how others use it differently, and that opens up my understanding of other people, if nothing else. And isn’t that a good thing? I also have been thinking about feedback and constructive criticism from the perspective of someone who has offered it. Sometimes, people consider what we have to say, and sometimes, they get defensive, shut down, and quickly discard it simply because it’s inconvenient to hear or deal with. It’s amazing to me when I see several different people offer the same consistent feedback, and still, the input is quickly shoved away. Being defensive can sometimes simply mean we just had a bad day, but more often, it reveals a lack of maturity in us and a place where our growth is perhaps stunted at the moment. I have a few of those places in my life where I shove feedback out as fast as it is being offered. Those are places I can still choose to open myself up and grow. It’s never too late, really. Now, when we offer feedback, to be fair, it’s not always going to be received and implemented. We can’t expect every person on this planet to see it our way, but when the same problems keep coming, and several people offer solutions that aren’t taken—or even considered—the result is simple: no growth. Do not speak to fools, for they will scorn your prudent words. It doesn’t matter what it is we do: spouse, parent, soccer coach, small or large business owner, administrative assistant, donut maker, teacher, truck driver, writer. It’s universal. If we want to get better at what we do, we have to listen to what people say. We don’t have to change everything about ourselves or how we do things, but we will never grow at all if we do life, our job, or even our families in a vacuum. We should be wary of surrounding ourselves only with people who flatter us and tell us what we want to hear. We should constantly tap into the strengths, experience, and wisdom of others. Where there is strife, there is pride, but wisdom is found in those who take advice. Walk with the wise and become wise, for a companion of fools suffers harm. I think before all was said and done, 30 titles made the short list. The one I started out with was too edgy, even though it captured well where I was coming from: “Not Just Sucking in Air: Finding God’s Purpose in Each New Day.” I guess you can’t say “sucking” to a lot of people. I guess it’s off-putting. I get it on some level; I really do. Perhaps it is a degree short of palatable to word people. To me, this writing journey started at a place where sucking in air was all I thought I was capable of—and that, just barely. I had to write when I discovered joy again, when I realized God had so much more for me than just taking in oxygen every day, but on the days I only managed breathing, He was still there, not considering me a failure, cheering me on to greater purposes. So when I opened this title question up to others, it was extremely vulnerable for me, considering what the original title signified for me. I received amazing amounts of good feedback. I learned that people enjoy being part of the process and weighing in. And it was very helpful, but it also tossed the book in about five different possible directions, each accurate in its own way. Some folks said, “shorter,” while others said, “longer.” Some wanted more narrowing in, while I wanted to open it up a bit wider without being too general. And what I discovered was that this writing thing is not an island. People are willing to help. I also figured out that asking for help is a good exercise. Listening to constructive criticism is incredibly valuable. And humbling oneself is a way of simplifying the complicated. When our face is to the floor in humility and we are at our most open, there is tremendous clarity. When we hide behind our wall of pride, our view is greatly blocked. And I loved seeing the hearts inside the people contributing their voices to the title. Knowing so many of them personally, it was sweet to see how their offered words matched who they were at the very heart. So while I made myself a little crazy contemplating each word, its position in the title, the nuance, the possible connotations (depending on where people are coming from), and the effect on different possible readership, it helped me zone in on what is really important and who my audience truly is. Why should they listen, if I can’t? I grow so much as a writer and as a person each time I ask outside myself. I’m so grateful for others who participate in life with me, even when they have something challenging or hard to say (or for me to hear). God gifts us with so many people to speak into our lives. I love it when I remember to tap into that amazing, overflowing resource. I would have missed out greatly on the beauty of what others had to say had I not done this. If we can’t even let them finish that sentence without getting defensive, or we are already formulating a response in our heads to counter it, we might have a growth problem. To answer before listening-—that is folly and shame. I’m not sure what’s going on here…preparing for another Ice Age? Looking for Godzilla? There’s “organized dinosaur activity” in my family room this morning, and I’m not totally in on the secret. I’m a little afraid. The thing is: I’m starting to feel like those dinosaurs, like I’m following blindly toward a finish line without really stopping to think along the way. For all they know, they could be headed to the tropics as they march along together without questioning. I feel like I’ve been going through the motions, too, lately: Get this kid from school to go to an hour and a half orthodontist appointment, only to get that one back to school and grab the other one from a different school for a different appointment. Life can feel that way sometimes. Schedules start to define us. Suddenly we are marching in a dinosaur line. Zooming out a little, I have to wonder if somewhere along the line, the first dinosaur said: “You should take at least three [fill in the blank here] classes, try this after school club, be in a book club, and while you’re at it, try your hand at the trombone and xylophone.” And the second one in line might have questioned it at first, but he decided maybe letting someone or something else dictate his life for him was easier. So he went along. And then on down the line. By dinosaur No. 6 in line, they stopped questioning and followed the herd. For a while, I think I was one of these dinosaurs. I jumped into too many commitments thinking somehow I could keep it all going. I followed the first few good ideas I heard and then realized, halfway in, that I was walking in a stress pack with a bunch of other overtaxed dinosaurs. We had gone miles together without even realizing how worn out we were. I started this year off saying I wouldn’t do the dinosaur walk. It was okay if I didn’t follow Brontosaurus the exact same way because I’m a Stegosaurus, after all. But that pesky T. Rex sure had some great ideas, and I figured out pretty quickly I’m not a T. Rex. I’m a Stegosaurus. So I said “no” to the T. Rex. And as proud of myself as I was for saying “no” for 35 seconds, drawing a boundary over here, “no” often leads back to another “yes” somewhere else—and I was back in that line again. When you look at that beautiful dinosaur trail, it looks so appealing and orderly, doesn’t it? They look like they have purpose. I want purpose. I bet you do too. But, I figured out that purpose didn’t come from following every great idea out there. 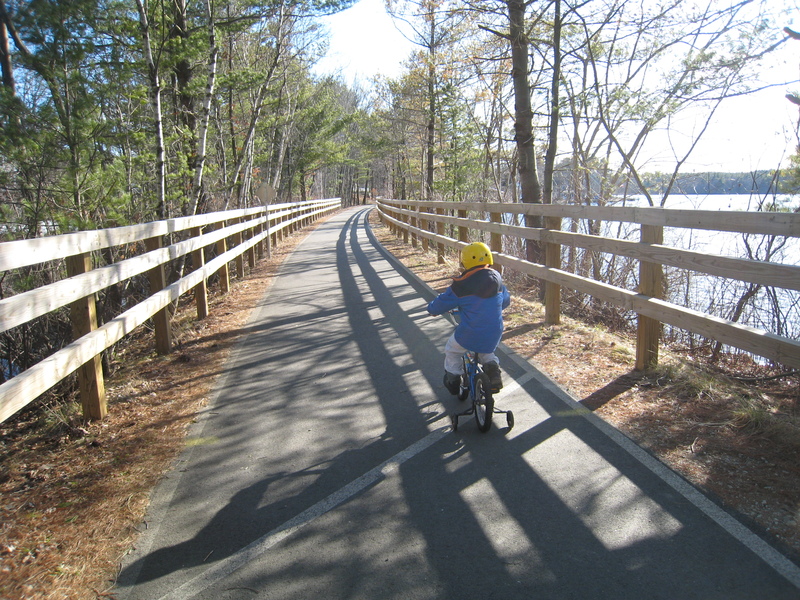 Sometimes, it involved trying new things out on the trail, but often, it meant getting out of line to regroup. But I forgot to tell myself that. Everybody else out there always makes that line look so attractive. Oh, flag football! Let’s try that! And, woodworking club, awesome! Crew? Let’s sign up! Diving team? Go for it! And those things are awesome. I wish I could keep up with it all. But I think we’re all out there marching around like tired dinosaurs because we’re either driving people to these things, or we’re in them ourselves. I’m a “let’s keep busy and do” junkie. I bet so many people can relate. The thing is: I love each and every one of those things—as long as I don’t think they define me. As long as I remember to jump out of line now and again. I wonder if we followed this particular group of plastic beasts around, if we’d find that they each eventually figure it out and drop out of line. Maybe they end up in the tropics after all and wonder how on earth they ever got there without noticing? I don’t think I’d make it that far. I want to know how not to over-involve myself, even when other people have really great ideas of what we could participate in together. I want to be more still. I want to get out of the dinosaur line and learn what it truly means to have God “establish my steps.” I’m pretty sure that’s where peace and calm can be found. *This blog can also be found at Mom 2 Mom Link-Up #24. I have both introverts and extroverts in my home. My kids have had their moments (and, like anyone else, we have plenty of struggles, as evident by my blog posts), but for the most part, they respect authority, as far as anyone outside the home is telling me. They get good marks for citizenship. They are not disruptive in class. But they are among the silent, unrewarded in the current society. The school is filled with them. But they are not the ones getting the reward cards and certificates for behaving well. Not most of the time. Most of the time, the more behaviorally inappropriate kids are rewarded when caught in the act of good behavior because the adults who work with them are so relieved there was a good moment, and they want to positively motivate them. That’s not a bad thing, necessarily. I am all for positive motivation. I’m not actually wishing for rewards for my kids. I’m just concerned about what they’ve come to mean. What about those kids who are already being respectful 90 percent of the time or more? We have found, in our family, that they are just expected to keep being behaviorally awesome with little to no reward. It becomes an expectation on them, an assumption. And I think good behavior should be an assumption. I don’t think we should get a reward for sitting quietly in class when we are 11 years old. But why is it not where the bar is also set for the kids who act out more regularly? Their bar is set lower. If they are respectful 4 out of 10 times, they get the figurative cookie. I have watched this play itself out over and over again in several settings lately, and it’s appalling to me every time. Just as not getting noticed for improved behavior can be disheartening for a child really trying to do better (I believe in recognizing that), consistently not being acknowledged (even a quick word of praise) can also be very discouraging to children already achieving good behavior. It doesn’t matter if it’s school or an after-school activity, Jenny Do-Right watches Betty Act-Out get coins, candy, stickers, a reward certificate, first in line, etc., when she makes a right choice. Jenny Do-Right quietly offers these same expected, correct behaviors 9 or 10 out of 10 times, and she often receives no recognition. Honestly, one of the few places I *do not* see this happen is the martial arts, where respect drives the entire program. Of course, that can depend on the instructor and how the studio is run. For our family, at the studio where my sons learn, their level of respect is indeed rewarded. Outside of that arena, not so much. I realize that some kids have more outgoing personalities. So, for example, Jenny Do-Right might get a bit more acknowledgement if she’s a go-getter, more visible, a charming personality to boot. But Janey Do-Right might behave just as well but more quietly in the classroom, meeting classroom behavior expectations but silently wondering if anyone is noticing? Does it matter if you behave well? Maybe you have to misbehave a lot first to get that certificate for behaving well. Who are we motivating here? In our house, we tell the kids that their character—not how many behavior “cookies” they tangibly earn but who they are—in the long run, will get them that job, that respect, that interning opportunity. And that may be true in a lot of settings, but is it true most of the time? What happens to a generation of kids growing up on: “Here’s a reward for not acting like a total jerk in the past 10 minutes”? What are their expectations going to be in high school? College? Trade school? What does that look like in their future job? What happens when they screw up relationally and think their significant other will settle for 4 out of 10 good behavior days? And what about the message to the consistent behavers all these years? What did they take in all this time that they carry with them into adult life? People only notice you if you’re loud and attention-seeking through either positive or negative behavior. You get multiple chances, so why put effort into being attentive and respectful the first time? Being respectful carries little value. The squeaky—and sometimes obnoxious—voices get what they want, no matter how they treat people. When do they ever get their “thumbs-up”? Does it ever come? I’m curious what you think? Where do you see this the same way as I do? Differently? I want to end by saying that in no way am I putting down children with behavior challenges. Some children struggle with real behavioral challenges basing from mental health issues and disorders/delays. My examples in this blog are not referring to children with those very real struggles. I’m talking about the lack of respect in our culture that is so prevalent in our child-rearing. We all have moments with our kids that we wish we didn’t. I’m referring more to the pervasive problem of children growing up without enough expectation, boundary, discipline—and that this has resulted in us giving them plaques for the slightest improvement in what used to be expected behavior to begin with. In my opinion, both ends of this spectrum suffer with this current culture of what is “noticed behavior”: both the Jenny Do-Rights and the Betty Act-Outs. I’m asking: How can we save these kids from these wrong messages and be part of the solution, not the problem? I’d love to hear from you, if you would like to leave a comment below. 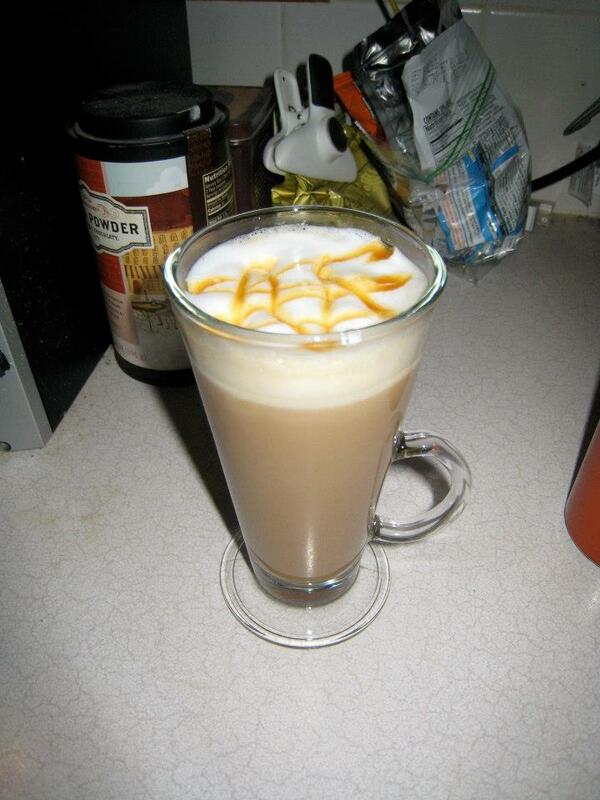 See this latte? If you’re a coffee drinker, it looks awesome, right? Very inviting. Foamy. Caramel drizzle. Love in a cup, no? See the mess behind it? I’m going to let you in on a little secret: I left it in the picture on purpose. Because lately, that’s just how I roll. This little story is about more than a steaming vanilla latte on my counter waiting for me. It’s about life with no margins versus life with margins. 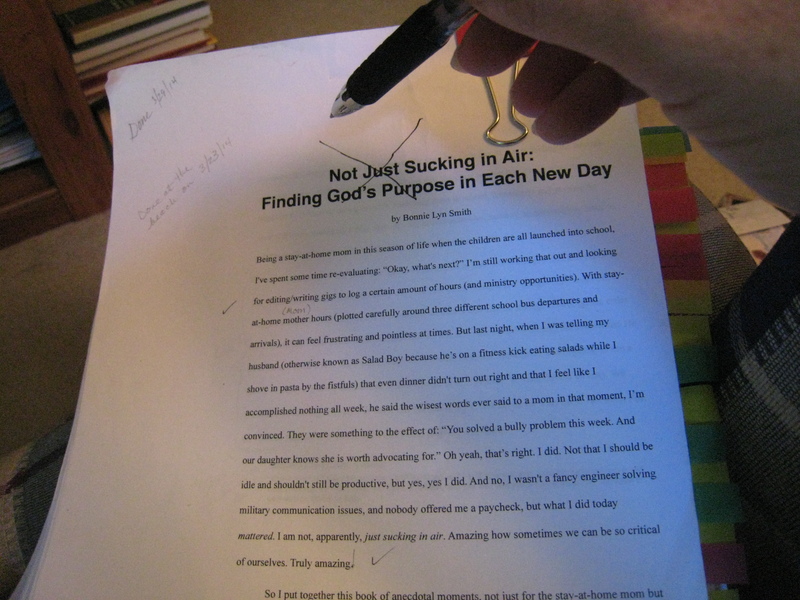 As a book author, just days away from Not Just on Sundays hitting the public, I am learning a lot about margins. For formatting reasons, I have to have inside and outside margins, so that there is room for the paper to be cut as needed to make a neat, perfect 6 x 9 book. I also need a gutter margin so that there is space in the binding; when someone opens the book, he/she doesn’t want to try to read my words sinking deep into the middle. Needless to say, without margins, books are an epic fail, a mess. They need clear boundaries: distinct “start” and “stop” places for the words. Even the headers and footers need space in-between themselves and the main text. Otherwise, everything lacks clarity. It turns out life is that way as well. It needs margins. If I plan back-to-back events with my kids, there is no driving time, no accounting for traffic delays, no time set aside to eat. If I overplan our schedules, I can’t pick three kids up from different locations at the same time. Likewise, if they don’t have any time outside of school, cross country, dance, marching band, and karate, they will not be able to do homework, to get rest, to unwind, to restore themselves. As it turns out, I can’t publish a book and keep my house clean and meet every need in the kids and finish important conversations and remember people’s birthdays and return phone calls within respectful amounts of time and grocery shop. Nope. For a while, I was putting pressure on myself that I could do all of those things well. Not long after, I quickly swirled into a tunnel of not only can I not do them, but I suddenly couldn’t remember to stop to take my vitamins, shower, read, eat regular meals, etc. I started living life without margins. And, like the text of a poorly formatted book, I bled into the margins. Publishing term for you. Bleed (blēd) (n.) Text or graphics that extends all the way to the edge of the paper it is printed on. Bleeds are used in publishing for graphical effect and for printed tabs. Most printers cannot print all the way to the edge of the paper, so the only way to produce a bleed is to print on paper larger than the final page size and then trim the paper. (v.) To run to the edge of the paper, thereby producing a bleed. What did living without margins do? It bled into my relationships (no time to meet). It bled into parenting and marriage (a lack of patience). It bled into my sleep patterns (a screen right before bed and a 1:30 AM bedtime). It bled into my health (one should get regular rest, meals, exercise). It bled into my prayer life (quickly zapped-off prayers instead of more time listening to Him and dialoging as if we were at coffee together). But unlike the cover art of a book that is supposed to bleed over the edges for printing purposes, the text of my life was spilling out of the margins. Text needs con-text. And the con-text of my life was living, breathing, eating time up in blog-writing, book pre-launch and launch, and publishing. There was no margin in my context. So, the latte on my counter? The one with the trash behind it? Today that is my built-in margin. I’m trying to get them back, one edge at a time. The countertop can remain messy for a few days. I’m not superwoman, after all. The laundry is probably not going to make it upstairs, but it’s folded to be pulled out of the basket. The book will be published. It’s just a matter of days now, hopefully. But I need to get my edges with a little wiggle room again. Otherwise, I’m, well—edgy. And that’s not only not fun to be with, but it’s a hectic way to live…on the edge. Margins in books are boundaries for the eye to know where to read without too much busy. They are how the mind sorts out headers and footers, but the printer needs the area also to keep the edges clear for paper being cut without taking text with it. I don’t want to have my text removed—either in my book or my life. Without margins, something gets cut out. It has to. We can only do so much. Margins in life are boundaries too. They are healthy spaces where we are just still. Where we don’t have something scheduled. Where we have down time. Where we say “no” so we don’t lose our context—or the “text” of who we are. Today the latte mug sits on the counter, happy to be accompanied by trash that will eventually be thrown out. It represents a choice to respect myself and others around me enough to insert margins again. Is anyone else also needing some? I want a “rebuke the wind and waves” of life kind of moment. I want to find “completely calm” again in-between the frenzy. Who’s with me? He [Jesus] got up, rebuked the wind and said to the waves, “Quiet! Be still!” Then the wind died down and it was completely calm. My heart is not proud, O LORD, my eyes are not haughty; I do not concern myself with great matters or things too wonderful for me. But I have stilled and quieted my soul; like a weaned child with its mother, like a weaned child is my soul within me. 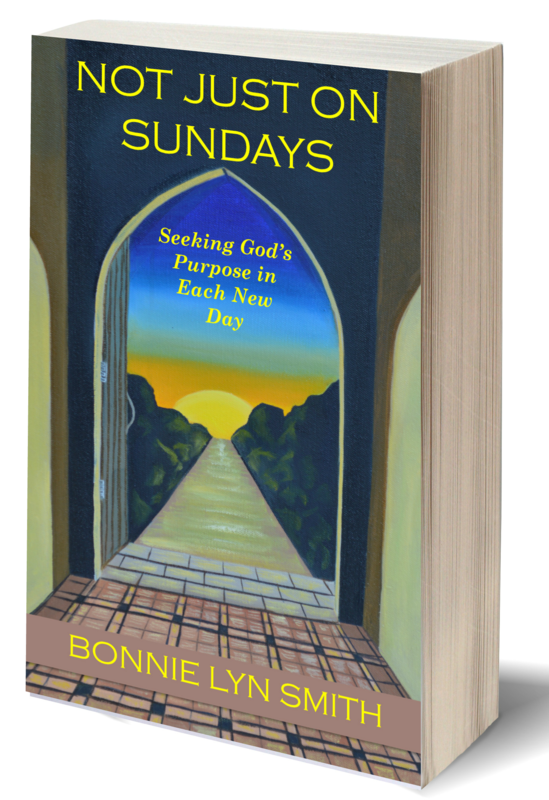 *Update since this post was written: Not Just on Sundays: Seeking God’s Purpose in Each New Day published October 1, 2014. It is available in paperback and as an ebook. 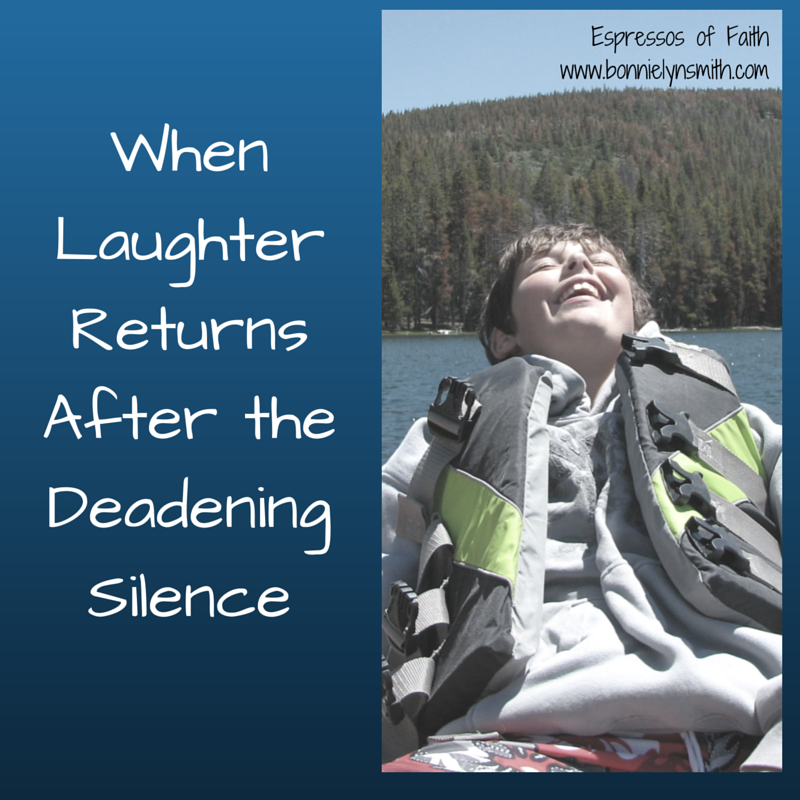 This post has been shared with Christian Mommy Blogger, Blessing Counters, and Tell His Story.